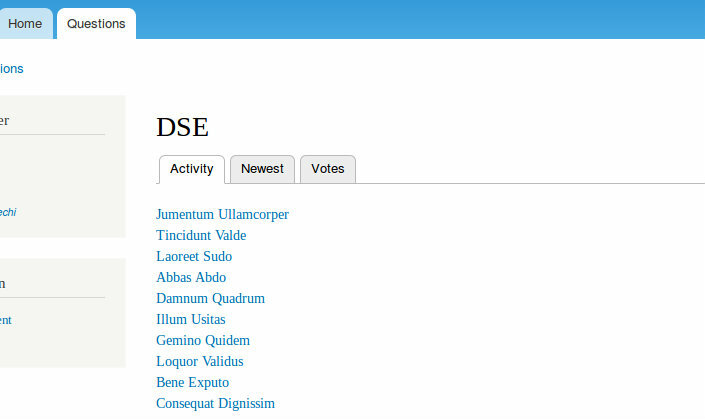 I'd like to create a view for my users' profile page, similar to the 'Questions' block one finds on the user pages on this website. Instead of the user's questions, I'd like to display the articles he/she created. The users should be able to reorder/filter the articles in the view by clicking on "filter links"/tabs similar to the ones I marked in the underneath picture. I don't know the exact term for this, but I suppose one calls this a tabbed view. It's also important that the path still contains the user's ID when one clicks on the tabs, because - of course - the Articles view needs this information, namely via the Contextual filter: (author) User uid > Provide default value: User ID from URL. What did I try so far? I've already created a view called Articles that displays all the articles that were added by the user. As any view would, it's displayed perfectly in the panel on my user profile pages. My next step was to add the tabs to the view. I followed @Jhilke Dai's answer to the letter, but as I mentioned before, the tabs don't show up when I don't give the Master display a normal menu entry (that's not what I want). Take a look at the QuickTabs module. You create a tabbed block via QuickTabs, with each tab itself being an already defined block, page, view, etc. 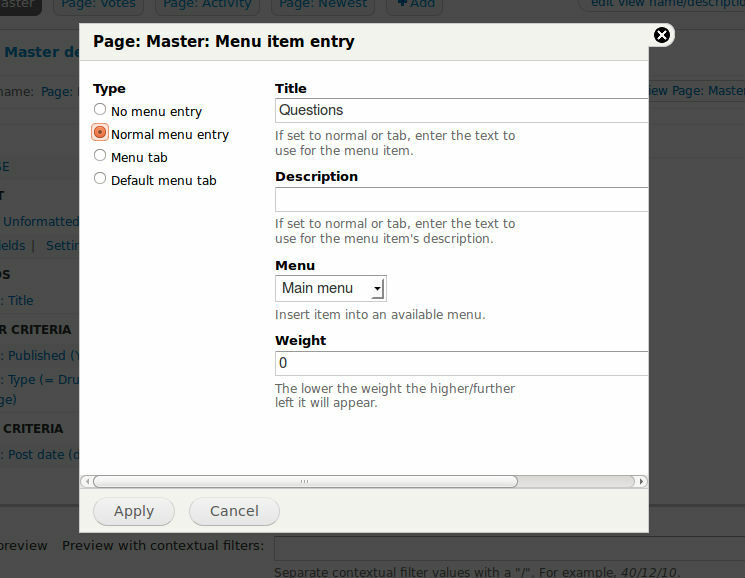 Then you add the QT block to pages the same as any other. You will probably need to create your own style for the tabs (it does come with a handful of predefined styles) to achieve exactly what you want. You don't need 3 views, just create one view with 3 pages Votes, Activity and Newest. define your fields and filters. 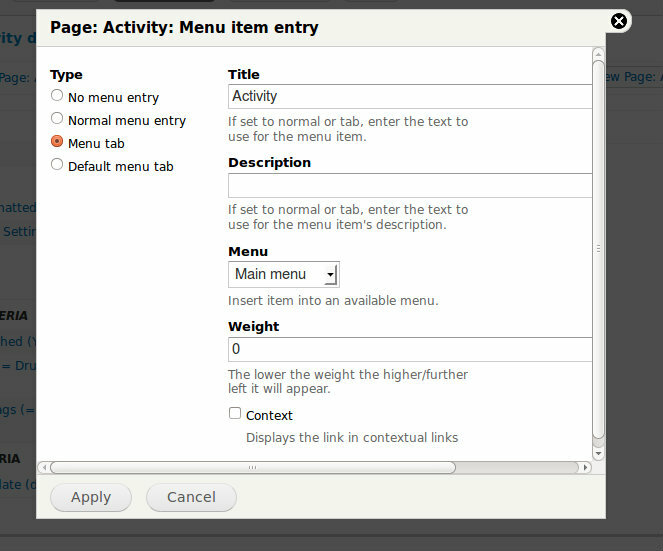 In Page Settings -> Menu Option, Use the Menu tab. Above was the previous reply, here is answer with some graphics. Note: To make tabbed menu it is required the path to be on the same Path like in above case questions/vote for Vote tab, questions/activity for Activity tab. Not the answer you're looking for? Browse other questions tagged 7 views panels routes or ask your own question. How to create a profile page? How to toggle views filter when user click on tab? Why don't menu tabs show for a view generated page? How to create view with user's flagged content? How to create a line graph of the total user points on a profile page? How to create tabbed menu consisting of views and a contact form while having unique paths for each tab? How do I re-order tabs in user page?